The Curly Wirly Twirly Girlies: My First Kit ! After more than ten years of traditional scrapping, I started digital scrapping in January to make it easier to complete an album for my mother in law's 60th birthday. I was totally taken by a few things about digi-scrapping - it was so much faster, so much less mess and waste, and so flexible (I could quickly change one layout for my son to one for my daughter and scrapbook whilst on the road with work), but mostly I was just astounded at the generousity of the online community. It did a lot to restore my faith in human nature and kindness. I am a dedicated freebie hunter, even those I don't gather I stop to admire and read the blog of the amazing, talented and generous people who make up the digi-scrapping world. From practical stock pieces and templates to amazing intricate art, I am so appreciative of all that is shared in this community. It made it easier for me to convert. I am also new to photoshop elements, and since I am still trying to locate a good manual (any tips gratefully received), I figured the best way to learn was to jump in there and experiment. I am not a designer, I don't have an artistic bone in my body, but I thought I would share anything I created to say thank you to all those wonderful women (and a couple of guys too ! ), who have shared their art, their time and their knowledge so freely. 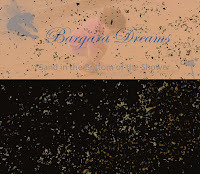 This kit is made up of stuff I created after our Easter long weekend at the most beautiful coastal town, Bargara. It is a little piece of paradise on the southern end of the Barrier Reef, here in Queensland, Australia (I am a very proud Queenslander !LOL). 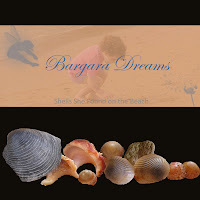 The beaches are fabulous, clean and still have shells. 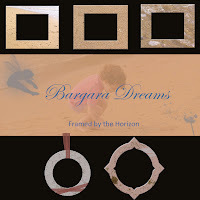 We just had a wonderful time, and cannot wait to get back so - the kits is called Bargara Dreams. I had seen a lot of people looking for sand overlays, so I have created one, and used it on frames, tags and paper for this as well. Please take the time to leave me a comment, I find that the time it takes to upload on 4-shared is time enough to say thanks when I am freebie hunting. It really does make a difference to the people sharing. So let me know if you like it, any hints to improve, winning lottery numbers LOL. Here are the first few pieces - enjoy ! (I have kept the downloads small for dial up). 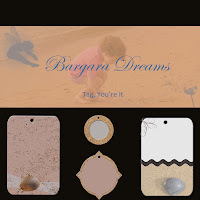 4 tags for journaling, dates or labels. Holes to hang them by, sand on all ! 5 frames. 3 landscape with beach backgrounds, two shaped with ribbon decoration and sand overlay. With thanks to Atomic Cupcake for the swirl brush and ric rac template. Ribbons to decorate or hang. Some translucent. With thanks to Atomic Cupcake. 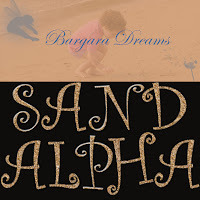 A dimensional alpha made of sand. Swirly like the waves and fun like the beach. A collection of shells my gorgeous daughter collected at the beach, for use individually or in clusters, add to the frames, whatever you choose. Some paper linens plain and with sand on them. Thanks to Atomic Cupcake for the linen texture. A sand overlay. PNG file. Vicki from A Work in Progress sent me. Since we live in Florida I'm sure I'll be able to use some of these great paper and elements. This is a really neat kit. Thank you! What a teriffic kit! LOVE IT!!! So glad you've joined the ranks! You are very talented, these goodies are delightful. Thank you very much.